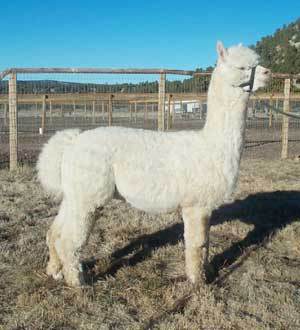 Eros is a 3/5 Peruvian male out of our Accoyo herd sire Amador PCA. Eros has great conformation and appears to have inherited his father's structure and regal presence. His fiber qualities are admirable, exhibiting good crimp and lustre, with incredible density and coverage from head to toe. We feel Eros has the qualities any breeder would desire in their breeding program. Fee SOLD! Congratulations to Lillith & Jonathan Avalon of Alpacas of Avalon.